These pieces are rare relics of the humble beginnings from which the international Studio Glass Movement developed. Photo: Courtesy of Toledo Museum of Art, Richard Goodbody. 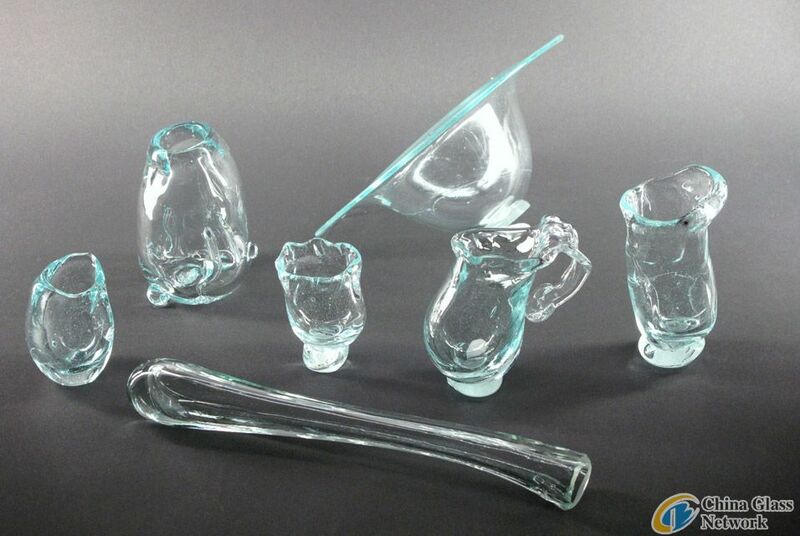 TOLEDO, OH.- The seven greenish-blue glass vessels recently acquired by the Toledo Museum of Art look more like the products of a first time glass blower than masterworks destined for one of the world’s greatest glass collections. But in fact, they are the work of two first-time glass blowers who happened to be in attendance at the famed March 1962 Toledo Workshop. That workshop, and one that followed in June of that year, are widely credited with launching the American Studio Glass Movement. Ceramicists Tom McGlauchlin and Edith Franklin both attended the inaugural workshop hosted by the Toledo Museum of Art and led by Harvey Littleton. The two vessels donated by Pat McGlauchlin, wife of the late Tom McGlauchlin, and the five donated by Toledoan Edith Franklin are among the very few surviving works from the group’s experiments in glass. The only other object from the first workshop in a public collection is a single example of Littleton’s work at the Corning Museum of Glass in New York. Most of the vessels from the workshops did not survive because of inadequate annealing (cooling) equipment. In 1962, recent University of Michigan graduate Edith Franklin had a front row seat to history being made. One of only seven students to register for the glass workshop held in a garage space on the Museum’s campus from March 23-April 1, Franklin had no prior glass experience. Although she went back to ceramics as her medium of choice for the rest of her career, the work Franklin produced was strikingly similar to that of Littleton and McGlauchlin, who went on to have distinguished careers in glass. Wisconsin native Tom McGlauchlin also began his art career working in ceramics. He taught Harvey Littleton’s classes at the University of Wisconsin while his friend and mentor took a sabbatical to study the properties of glass in 1960–61. McGlauchlin’s artistic life changed when he took the two glass workshops taught by Littleton in Toledo in 1962. He went on to teach the second-ever glass blowing class to be part of the curriculum at an American university at the University of Iowa in 1964 (Littleton taught the first at the University of Wisconsin). McGlauchlin relocated to Toledo in 1971 and dedicated the next 13 years to teaching glass as part of a joint program between the Toledo Museum of Art and the University of Toledo. When he left the program in 1984, he devoted himself to making art full time. From 1978 until his death in 2011 he worked on a series of glass sculptures exploring abstract qualities of the human face. His work is in permanent collections in museums such as the Smithsonian Institute, the Portland Art Museum in Oregon, the Kunstmuseum in Düsseldorf, Germany, the Corning Glass Museum and the National Museum of Modern Art in Tokyo. These surviving vessels from the first workshop will be on display during Color Ignited: Glass 1962–2012, a major exhibition that explores the pivotal role of color in glass, from the first green tinted marble batch to Dominick Labino’s technical experimentation with color to the contemporary use (or absence) of color to make an artistic statement. The exhibition highlights artists who have worked in glass since this time period, including Harvey Littleton, Dominick Labino, Dale Chihuly, Dan Dailey, Laura de Santillana, Marvin Lipofsky, Heinz Mack, Klaus Moje, Yoichi Ohira, Ginny Ruffner, and Judith Schaechter. The show opens June 13 in the Museum’s Wolfe Gallery for Contemporary Art and runs through Sept. 9, 2012.